You might not get paid for it, but everyone who does it knows that being a mom is a full-time job. There always seems to be something else that needs to be done. There is some good news, however, and that’s that it’s easier than it used to be – in fact, it’s getting easier all the time – thanks to the great little gadgets that have been developed to help. Not only can they take the strain out of numerous day-to-day tasks, but they’re also coming down in price, so it’s increasingly easy to get hold of the assistance that you need. You can find gadgets like this in the mall, but locating the ones that you want is sometimes tricky, especially if you’re looking for something to do a very specific task. It’s often easier to search online. If you’re looking for inspiration, use a site such as New Easy where you can find all the latest innovative gadgets. This approach also helps you to keep up with new devices just appearing on the market. It’s a great way to pick up surprise gifts for friends with young kids because even when lots of people are doing so, you can be confident of finding something different. The first task to deal with in the morning, once you’ve got the children out of bed and washed and dressed, is making breakfast. Wouldn’t it be easier if you could prepare the whole meal at the touch of a button? There are a range of all-in-one breakfast makers available today that will do just that, cooking eggs, bacon, waffles, and more just the way you like them. Family-sized versions are available, so if you have a good coffee maker as well, you’re all set to start the day with minimum fuss. 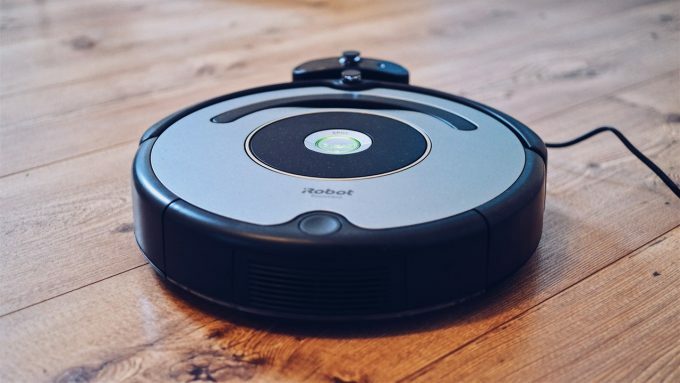 Helpful cleaning devices such as the Roomba have been around for a while now, but robot vacuum cleaners are getting more sophisticated. What’s more, they’ve now been joined by robots that can mop and scrub your floors, and by others that can clean your windows, taking the strain out of some of the day’s most tiresome tasks. You can control them from your phone, so it’s easy to direct them to where they’re needed while you’re doing something else, whether that’s hanging up the laundry or enjoying your daily workout. Getting the chores done is always more fun if you can play your favorite music as you go. That used to be a problem in bathrooms and kitchens when there was a lot of water sloshing about, but now waterproof Wi-Fi tech means that you can take music – or even television – anywhere. Most of these gadgets are also designed to be hardy, so it doesn’t matter if you accidentally drop them on the floor or in the sink. You can also get versions that conveniently stick to the walls. Baby monitors are now a commonplace way for moms of infants to make sure they’re safe while they’re elsewhere in the home, but child monitoring devices take that a step further, helping you keep track of any young kids. Embedded in ornaments or toys, they can let you listen in through your phone so that you know they’re safe when they’re playing in their room, and you’ll be aware of it instantly if anything goes wrong. Devices like this make it much easier to relax about giving your kids the alone time that will be increasingly important to their development. When it’s really too hot to be outside, or when it’s the middle of summer and everything seems to grow faster than you can keep up with, having a robot to help with the gardening is bliss. They can’t do everything yet, but they’re pretty good at weeding, saving that all-too-familiar strain on your back, and they can also mow your lawn, using their own judgement or following instructions that you send from your phone. They’re the greatest thing since built-in sprinklers for taking the effort out of keeping your garden looking good. Little gadgets like this can make a big difference in the life of a busy mom. Just freeing up half an hour a day makes it much easier to get things done, or to take time out for yourself. As new technologies continue to develop, things should get easier still in the future – so make sure that you keep up!